"I need to free up space on my computer. I think Windows System Restore is taking up a bunch of space. Can I delete System Restore Points from Windows in order to free up space or will that cause problems?" You are correct that Windows System Restore takes up a fair amount of disk space with multiple restore points on your computer. As long as you don't have any problems with your computer, it is reasonably safe to remove all but the latest restore point from Windows. 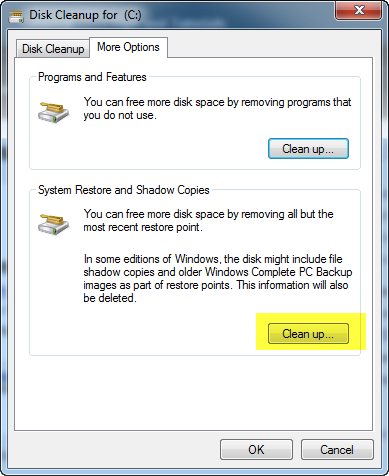 You can delete System Restore points from your computer, but the safest way to do it is to use the built-in Windows Disk Cleanup utility. 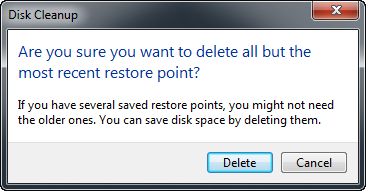 Finding the option to delete System Restore points can be a little tricky, so I'll walk you through it here. The Windows Disk Cleanup utility is accessed by going to Start > Accessories > System Tools > Disk Cleanup. This utility offers to remove a bunch of temporary files from your system, but can also be used to remove System Restore points by following a few additional steps. 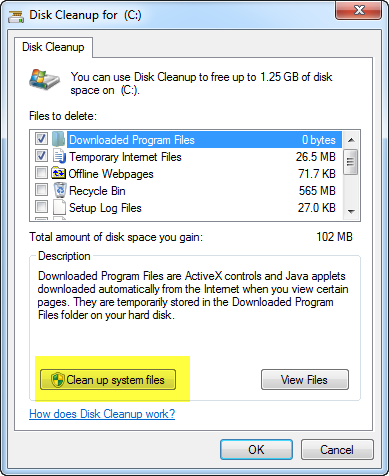 The first thing you will see when you launch Disk Cleanup is a small window that calculates what can be removed from your computer. Once this initial calculation is complete, you will see a screen with some options of things to be removed. Ignore these options for now and click the button to Clean Up System Files. Clicking the Clean Up System Files button reveals a more options tab. This second tab includes the option to remove unused programs and features, as well as System Restore and Shadow Copies. Clicking Clean Up under the System Restore section will allow you to remove all but the most recent system restore point from Windows, freeing up additional space on your hard drive. Disk Cleanup has an additional warning to verify that you really want to remove System Restore points from your computer. Clicking the Delete button removes any extra restore points from your computer.